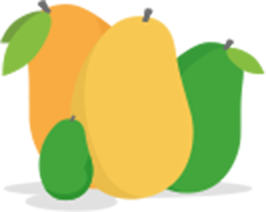 Navigating through the Mango learning system is now more intuitive than ever. 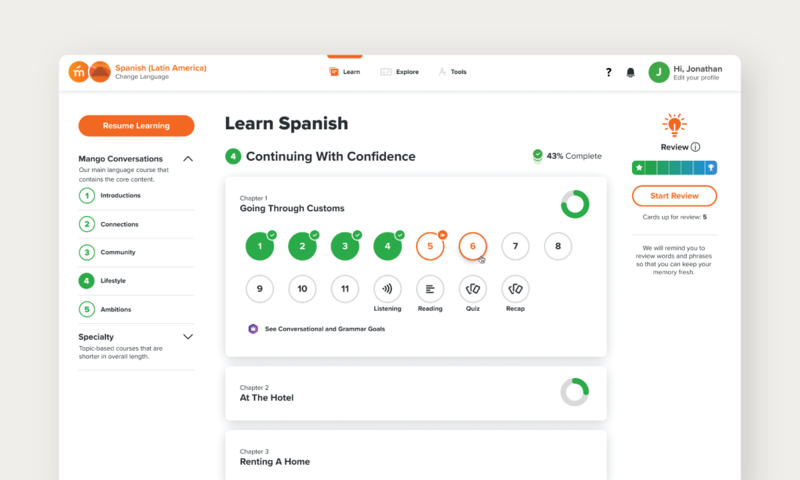 A clean, simplified layout allows learners to conveniently view and navigate all relevant language content all in one place. With direct access to Specialty Courses, learners can explore different aspects of the language they’re learning, from business-specific phrases to various cultural interests. 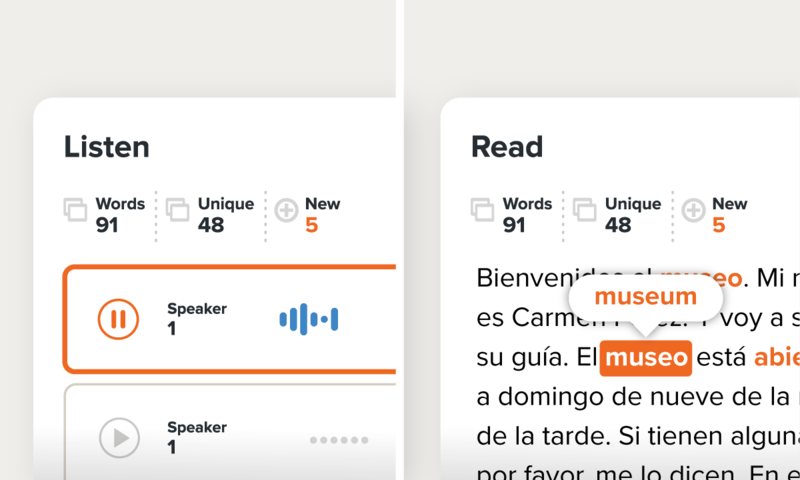 Learners can check progress at-a-glance with access to all of their chapters laid out in one smooth, vertical scroll — now learners can see how far they’ve come or jump ahead to what’s coming up next! Our top language courses now offer Listening & Reading Activities at the end of Units 1 and 2. Through interactive audio and written passages, Listening & Reading Activities introduce new vocabulary woven in with phrases learners have already mastered, while comprehension questions check learners’ understanding along the way. These new modes of learning provide learners with more opportunities to be constantly engaged with new and reinforced material, and to more rapidly develop their language intuition skills. Our most popular language courses have been restructured with additional content in order to provide a more comprehensive learning experience, and to align learners’ progress with international levels of proficiency. Blended into Mango’s proven methodology, the new course content expands previously four-unit courses into five cohesive units. 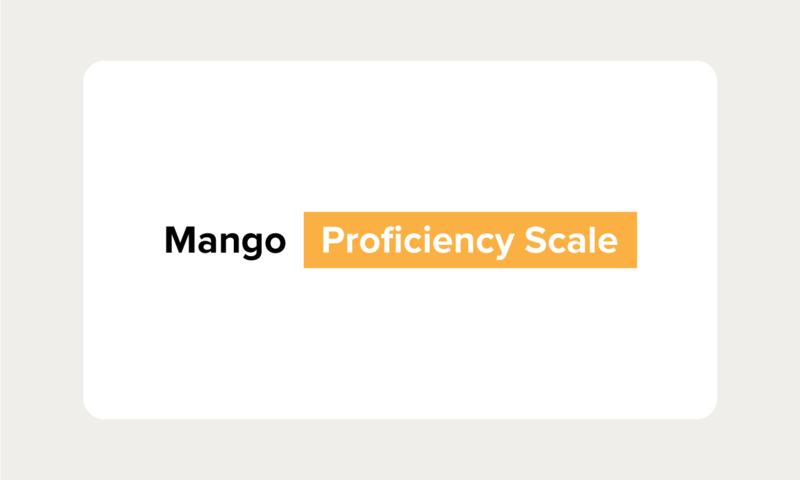 By uniting the ACTFL and CEFR standards to create the Mango Proficiency Scale, mapped exclusively to Mango content, learners can be confident they’re covering the material and topics necessary to achieve specific language goals to reach a higher standard of proficiency. 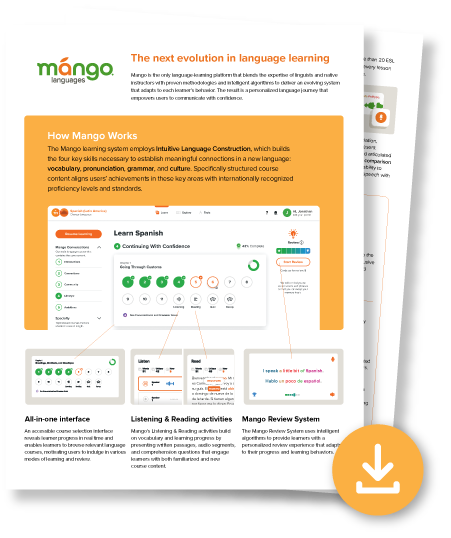 Download the product sheet for an overview of all the features offered through the enhanced Mango learning system.